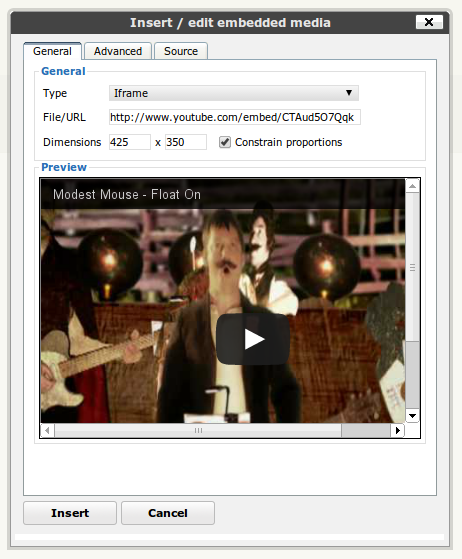 You can embed your uploaded videos using the Insert / edit embedded media button in the visual editor. Then, insert the URL of the video you want to embed in the File / URL field. According to the source of your video, this function will automatically choose the type of video you’re embedding as well as the advised proportions. Just upload the videos to your blog’s Media Library. Then, grab the file’s URL – for example, http://example.blog.com/files/2012/09/movie.avi – and paste it in the File / URL field that appears in the embed video window. Choose the Quicktime or Windows Media Player option and your video should be correctly embedded.